The unit is rapidly approaching full strength as more pilots pass rigorous tests to fly the J-15 fighter in all conditions. Zhao Lei reports. As China's aircraft carrier fleet expands and grows stronger, the People's Liberation Army Navy's carrier-borne fighter jet force is further developing its combat ability and moving toward the goal of gaining full joint-operation capability. Several groups of Navy pilots are now qualified to take off and land the J-15 fighter jet on the flight deck of the CNS Liaoning, the nation's first aircraft carrier. Some have been exposed to fierce live fire exercises that included breathtaking combat scenarios, while an elite team has carried out night landings - widely considered the riskiest carrier-based activity - and are therefore capable of undertaking round-the-clock, all-weather operations. 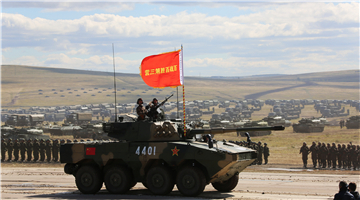 The endeavors and enterprising spirit of the commanders and pilots have seen the unit achieve initial joint-operation capability, according to the PLA Navy. All of these achievements have been made since 2013, something many foreign observers would probably not have anticipated five years ago, given that the PLA Navy had just begun operating the Liaoning and most of its naval aviation units were based at airports rather than on ships. Recently, J-15 pilots and their commanders, most of whom are also experienced aviators, have been speaking to the media about their training and the factors behind their impressive progress in the past few years. "We fly in clear skies. We fly in bad weather. We train day and night, and barely have time to take care of our families," Lieutenant Commander Pei Yingjie said. "This is because we are clearly aware of the differences between us and our potential opponents in terms of experience and capabilities." One of the younger members of the carrier-borne fighter jet force, the 30-something Pei said every time new pilots join the unit they encounter many new things - the J-15 jet, training programs, flight procedures and the operational environment. "We have no alternative but to train hard and make full use of every minute," he said. Senior Captain Xu Hanjun, commander of a naval aviation base that oversees the J-15 fighter jet unit at an undisclosed location, said his pilots are all top aviators with rich experience, and they were handpicked from combat aircraft units in the PLA Navy and PLA Air Force. However, they have had to overhaul a great many muscle memories - the process whereby repetition results in a person accomplishing an action almost automatically - and prior experiences to become accustomed to carrier-based operations, which have many differences from airport-based operations. "For instance, the landing procedure on the carrier is totally different to that at an airport, so our pilots have to fight many deeply ingrained customs and practices, and undertake many training flights before they can master this new expertise," Xu said. "Furthermore, the carrier's recovery area is much smaller than that at an airport - the runway is only about 30 meters long, while it is usually at least 2,000 m long at an airport. It's not a big deal if a pilot misses by 100 m when landing a plane at an airport, but it's a huge problem if they miss by several meters when landing on a carrier." In addition, unlike a ground landing site, the carrier moves in response to waves and tides, which also challenges the pilots' skills and response capabilities, he said. Lieutenant Commander Shi Jinjie, who is in the same class as Pei, said uncertainty is the biggest concern for young pilots like him and exerts great pressure on them. "We are likely to encounter fast-changing weather above the open sea. If we experience an emergency, there is nowhere for us to land our jet except the carrier, and we can't afford too many attempts if the first or second landing fails," he said. Pei added that the pilots understand they will face dangers and a number of unexpected trials in their training and carrier-based operations: "Risks and challenges always exist. 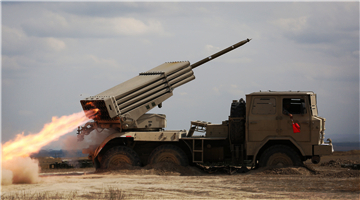 All we can do is to improve our capabilities and skills to ensure we are ready for them." 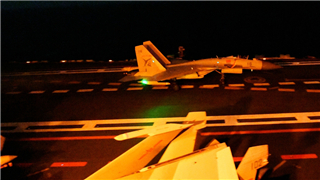 Captain Lu Zhaohui, a senior J-15 pilot at the naval aviation base, said night operations are a major part of modern naval warfare, which requires the carrier-borne fighter jet force to be capable of conducting operations in low visibility and difficult weather conditions over dark seas. "Landing a plane on a carrier in the dark is the hardest and riskiest of all nighttime operations and much more difficult than landing during the daytime," he said. "We have overcome a lot of difficulties to enable our pilots to perform night landings. The first was that we didn't know how to arrange the lights on the carrier's deck or how bright they should be." During the approach on a typical night landing, the pilots have no points of reference other than signal lights placed along the runway of the carrier's recovery area. The brightness of the lights is adjustable and subject to conditions such as distance and altitude, according to Lu. In addition, members of the deck crew also use lights when handling operations on the flight deck. "If the lights are too bright, they can cause the pilots to experience momentary blindness during takeoff or landing, which is very dangerous. If the lights are too dim, the pilots may not see them, and that could lead to accidents," he said, noting that every navy that operates aircraft carriers has experienced the same problems. Lu, his fellow pilots and a number of deck crew commanders carried out countless experiments and tests which allowed them to devise a number of lighting protocols to fit different times and weather conditions, he added. Captain Xu Ying, commander of the J-15 unit, noted that it is extremely difficult and dangerous to land a plane on a narrow, seaborne runway at night, since the lack of reference points can impair the pilots' sense of direction. Moreover, their ability to react and make judgments is substantially reduced when flying in total darkness above the ocean. "We learn to depend on landing-assistance instruments on the aircraft and the carrier, and on instructions from signal officers," he said. "Our aviators need to undertake repeated training procedures in night operations to gain more experience." Li Jie, a well-known naval researcher in Beijing, said, "As soon as a sufficient number of the carrier-borne fighter pilots are qualified to carry out round-the-clock operations, the carrier will come closer to full combat capability." China commissioned the CNS Liaoning in September 2012. Two months later, Senior Captain Dai Mingmeng landed a J-15 on the carrier's flight deck, becoming the first Chinese pilot to achieve the feat. China has now built its second aircraft carrier and it has undergone two sea trials. The new vessel, the first to be designed domestically, is basically identical to the Liaoning but has several modifications. 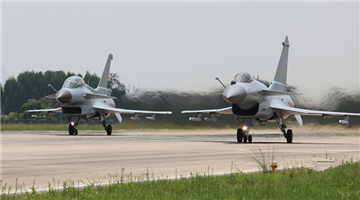 In May 2013, the carrier-borne fighter jet force, the first of its kind in the PLA and one of the youngest units in the Chinese military, was established in Northeast China. 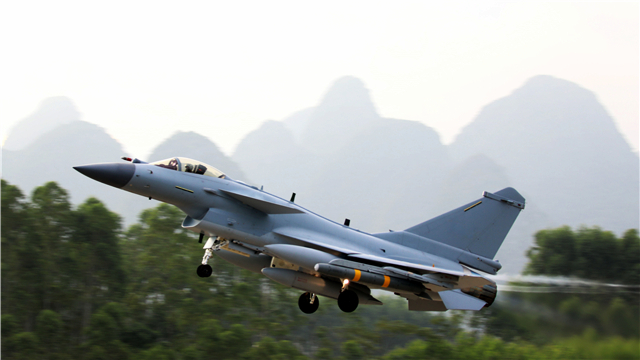 In August of the same year, President Xi Jinping, who is also chairman of the Central Military Commission, inspected the unit and observed a series of takeoffs and landings by a J-15 fighter jet at its base. The force has now gained enough experience to shorten the time required to provide full training for J-15 pilots. Since 2015, the unit's aviators have flown their jets in three parades, including the country's largest-ever sea parade, which was conducted in the South China Sea in April. As a growing number of pilots have mastered the basic skills of flying carrier-borne fighter jets, they have started to move on to the next stage of their training - honing their combat maneuvers. 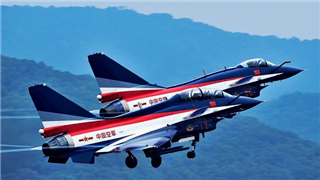 Sun Baosong, a captain at the naval aviation base and a J-15 veteran, said aviators now spend most of their time practicing group tactics and combat maneuvers. He recalled a fleet defense exercise during a training operation on the Liaoning in which he and another pilot were ordered to intercept incoming aircraft. 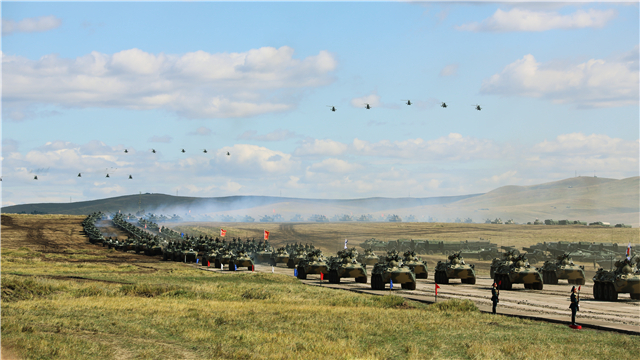 The exercise was intense and realistic, with each side sparing no effort to beat the other. The adversaries were tough, and they were accompanied by planes fitted with electronic-warfare systems, which made the task even tougher. In response, Sun and his fellow trainee decided to adopt an audacious but risky tactic by making a long-distance, sea-skimming penetration run to strike the "enemy's" base. They succeeded and gained useful experience in the process. Captain Xu echoed Sun's remarks, saying a considerable proportion of his unit's training has shifted from flying skills to tactical tasks. "Next, we will select and train more pilots for the carrier force and strengthen the combat capabilities of our current airmen," he said. According to Sun, in addition to the force's progress, relations between the unit and the Liaoning's flight deck crew have become closer and smoother. That has produced obvious results, and the carrier is now capable of carrying more fighter jets and can launch and recover a larger number of aircraft more efficiently. In addition, pilots and members of the carrier's crew have established specific procedures for deck operations. 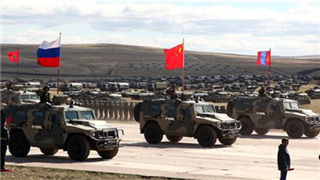 "In the past five years, we have reached the East and South China seas, as well as the western Pacific Ocean. 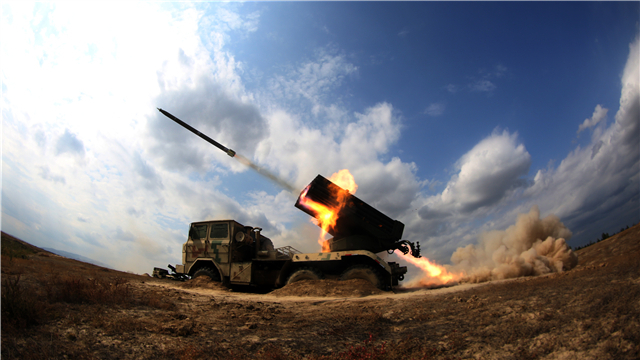 We conducted many tactical drills there and verified our capabilities," Sun said. 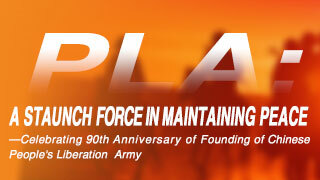 "In the future, we will go farther and undertake more missions." 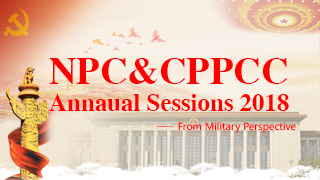 The Communist Party of China and the military have conferred many honors on members of the force as a reward for their accomplishments and contribution to national security. In August 2014, Xi conferred the honorary title of "Heroic Test Pilot of a Carrier-borne Fighter Jet" on Senior Captain Dai, who was deputy commander of the unit's aviation base at the time. In November 2016, Xi made a posthumous award to Lieutenant Commander Zhang Chao, who died in a training accident earlier that year. In addition to Dai and Zhang, seven members of the unit have been awarded a first-class military service citation, while others have received second-class citations. Despite their achievements, the unit's commanders are not complacent, according to Senior Captain Zhang Zhongming, political commissar of the naval aviation base. "The training of carrier-borne fighter jet pilots must be accelerated to pave the way for the Navy's aircraft carrier plans," he said.